There will be cake. It may take me a few weeks to share the recipe with you, but I promise there will be cake. 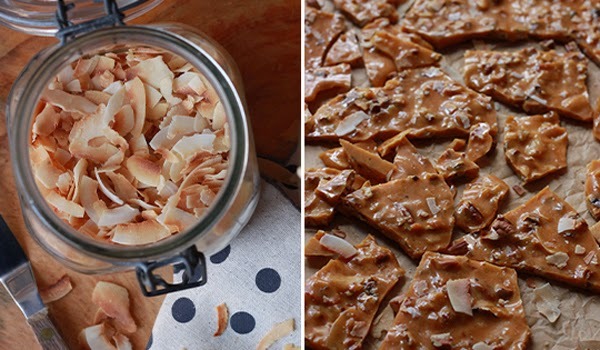 Consider these your warm-up recipes - a rich Coconut Pecan Toffee and a Coconut Caramel Sauce with no dairy! Also tips for toasting nuts and coconut. I've been a little MIA here and on social media and even a little bit in real life. We've been traveling and working, preparing for a kitchen update and for bringing home a new baby in mere weeks. Weeks, you guys! I'm completely unprepared for a new baby and blogging seemed like reasonable enough procrastination from putting the crib back together. Truthfully, I'm not sure that I will get back to blogging here regularly until next year at least, or honestly ever. I have no idea what having two kids, working freelance, and still being a normal human will look like so I'm only promising you cake at this point. A one-bowl-rich-and-moist-chocolate cake, no less. Let's call it Denial Chocolate Cake. I've been sitting on these recipes for a while, because they didn't seem appropriate for the spring or summer. The weather in the South has finally decided to be fall, which has me ready to bake, carve pumpkins, and find some new boots - basically any fall activity that helps me avoid putting the crib together or crying over tiny baby socks. Line a baking sheet with a silicone baking mat or parchment paper. Set aside. Combine the sugar, corn syrup, salt, and water in a heavy-bottomed 2-quart saucepan. 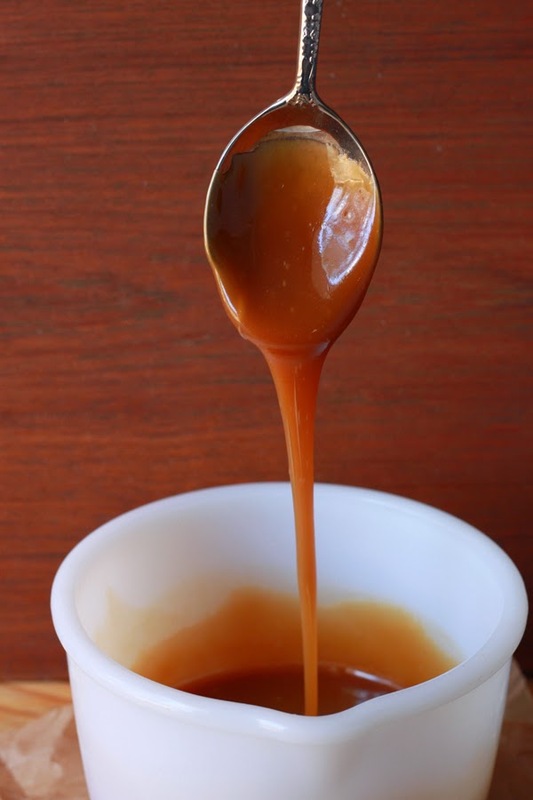 Stir until sugar is dissolved and bring to a boilAttach a candy thermometer to the pot and continue cooking until temperature reaches 300 degrees F.
Remove saucepan from heat and quickly stir in butter, vanilla, and baking soda. Immediately add the coconut and pecans. Pour onto prepared baking sheet and use a silicone spatula to spread the mixture into a thin even rectangle. Cool completely on a cooling rack. 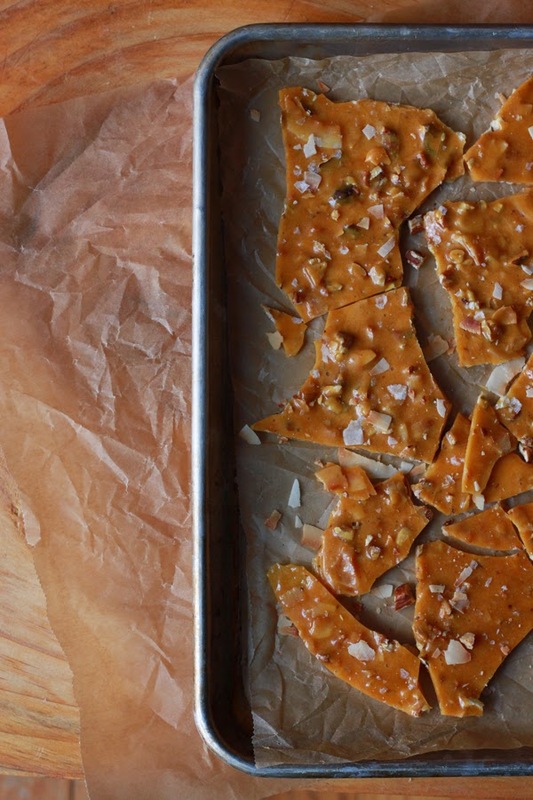 Snap the brittle into pieces and store in an airtight container at room temperature. 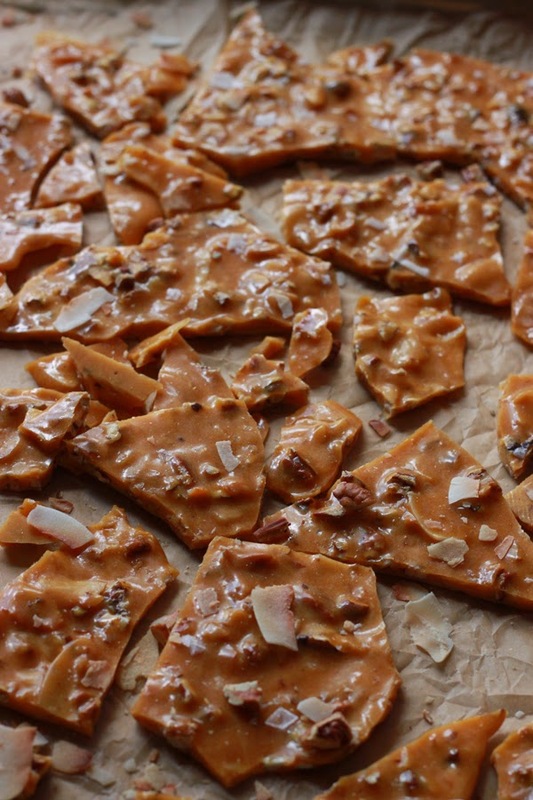 Brittle can be made up to a week before assembling the cake. Combine the sugar, water, and, corn syrup in a heavy-bottomed 2-quart saucepan. Attach a candy thermometer and cook over medium heat, without stirring, until the mixture turns golden amber and reaches 320 degrees F.
Immediately remove from the heat and add the coconut milk, vanilla extract and salt and stir carefully. Return to medium heat and cook until the mixture reaches 230 degrees F. Pour the caramel into a heat-proof bowl and cool for 20 minutes. Fold in the coconut and pecans and cool completely. The finished sauce can be made up to a week in advance – store in the refrigerator in an airtight container and bring to room temperature before assembling the cake. Heat the oven to 350 degrees F. Spread the coconut into an even layer on a baking sheet and bake for 5 minutes. Stir the coconut and bake an additional 2 to 3 minutes or until golden. Remove from the oven and cool completely on the baking sheet. Store in an airtight container. Coconut can be toasted up to 2 weeks ahead of assembling the cake. Heat the oven to 350 degrees F. Spread the pecans into an even layer on a baking sheet and bake for 8 minutes. Stir the nuts and bake an additional 2 to 5 minutes or until the nuts are fragrant and just begin to brown. Remove nuts from the baking sheet to cool completely before chopping or storing. Store pecans in an airtight container. Pecans can be toasted up to 2 weeks ahead of assembling the cake.